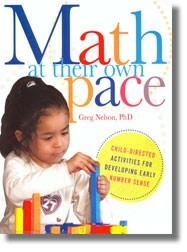 Math at Their Own Pace offers guidance on reacting to various student responses and provides variations that help tailor the activities to children?s abilities and interest levels. to give early childhood educators guidance in providing more maths materials into their classrooms so that children have plenty of opportunities to explore mathematical concepts. provide activities that are open-ended and hands on to help children develop logical- mathematical minds through flexible mathematical problem solving. maximize young children?s learning through activities that are self-directed and varied. encourage educators to build maths games and activities into their classrooms as a stable of their learning environments. introduce maths at an early age through exploration. The beginning of each chapter gives details regarding the developmental stages of the concept, the activities they relate to, and the signs of readiness At the conclusion of each chapter there is a list of related children?s books.